Constructs a new Authentication object with the given parent. Returns an AuthenticationRealm object that was registered with name. Tries to find the user with userinfo using the realm, returning a non null AuthenticationUser on success. Definition at line 49 of file authentication.h. This class will take ownership of realm. Definition at line 55 of file authentication.cpp. This class will take ownership of realm, store and credential. Definition at line 63 of file authentication.cpp. Returns true if the userinfo could be validated against a realm. Definition at line 74 of file authentication.cpp. 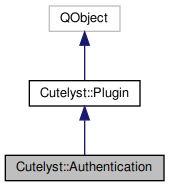 References Cutelyst::AuthenticationRealm::authenticate(), Cutelyst::AuthenticationUser::isNull(), realm(), and user(). Returns true if the request information could be validated against a realm. Definition at line 132 of file authentication.h. Logs the user out. Deletes the currently logged in user from the Context and the session. It does not delete the session. Definition at line 161 of file authentication.cpp. Definition at line 175 of file authentication.cpp. References defaultRealm, Cutelyst::AuthenticationUser::isNull(), Cutelyst::Session::isValid(), Cutelyst::AuthenticationRealm::persistUser(), Cutelyst::Application::plugin(), Cutelyst::Application::postForked(), realm(), Cutelyst::AuthenticationRealm::restoreUser(), Cutelyst::Context::setStash(), Cutelyst::Session::setValue(), user(), userExists(), Cutelyst::AuthenticationRealm::userIsRestorable(), and Cutelyst::Session::value(). Returns the authenticated user if any, if you only need to know if the user is authenticated (rather than retrieving it's ID) use userExists instead which is faster. Definition at line 113 of file authentication.cpp. Referenced by authenticate(), Cutelyst::RoleACL::canVisit(), setup(), and userInRealm(). Returns true if a user is logged in right now. The difference between userExists() and user() is that userExists will return true if a user is logged in, even if it has not been yet retrieved from the storage backend. If you only need to know if the user is logged in, depending on the storage mechanism this can be much more efficient. userExists() only looks into the session while user() is trying to restore the user. Definition at line 125 of file authentication.cpp. Works like user_exists, except that it only returns true if a user is both logged in right now and was retrieved from the realm provided. Definition at line 141 of file authentication.cpp. References Cutelyst::Component::name(), realm(), Cutelyst::Context::stash(), and user().